The name or term "Cobra" refers to more than one character or idea. For a list of other meanings, see Cobra (disambiguation). Crashing through the sky comes a fearful cry! An ancient, ruthless terrorist organization, Cobra are not just determined to rule the world—they practically already do, having been manipulating events on the world stage from the shadows for a thousand years. While they traditionally have preferred to control through business, politics and conspiracy, their advanced military technology and expansive armies form a deadly threat to even the most highly trained special mission force. 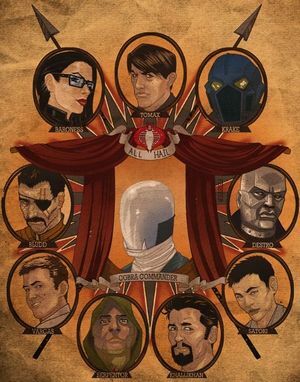 Traditionally, Cobra is led by a Commander and overseen by the Cobra Council; below them is Cobra High Command, who lead the lower-level workings of the organization. Individual members of High Command are afforded a significant amount of autonomy to pursue any agenda that furthers Cobra's goals; they'd better get results, though, as failure in Cobra can have deadly consequences. Early solicitations for First Strike portrayed Cobra as being under Ironblood's command for his attack on Cybertron before the story proper introduced the Iron Ring with Cobra being separately revived by the Baroness. This page was last edited on 10 December 2017, at 22:40.